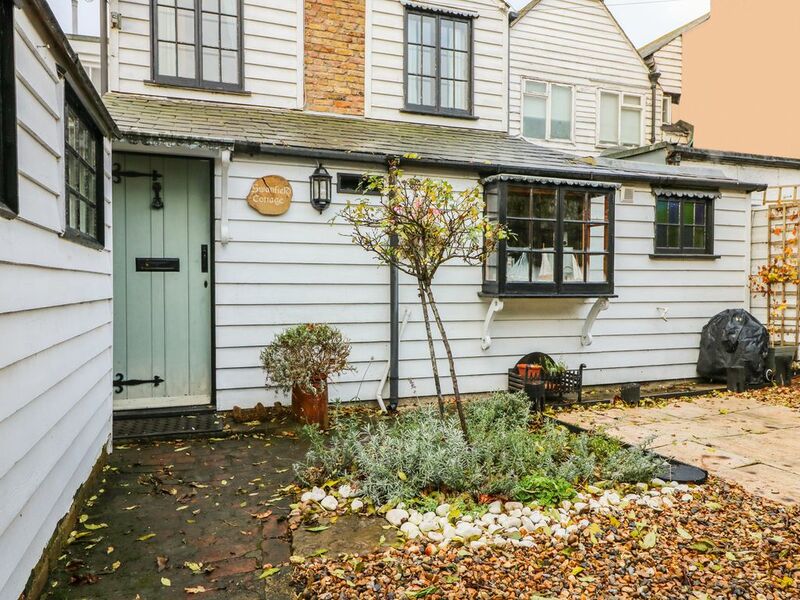 A cottage in the town of Whitstable in Kent, it can sleep two people in one bedroom. Swanfield Cottage is a cottage in the seaside town of Whitstable in Kent. It has a king size bedroom and a shower room, the property can sleep two people. Also inside there is a kitchen and a living dining room with a woodburning stove. To the outside there is roadside parking on the streets near to the property, there is also a rear garden with a patio and gravel area with furniture and a barbecue. Swanfield Cottage is the ideal spot for a romantic break at any time of year. Amenities: Electric central heating with woodburning stove. Electric oven and hob, microwave, fridge, washing machine, TV with Freeview, DVD player, WIFI, hair dryer, selection of books and games Fuel, power and starter pack for stove inc. in rent. Bed linen and towels inc. in rent. Free roadside parking around property. Private front garden with patio/gravel/shrubs, furniture and BBQ. Sorry, no pets and no smoking. Pub 2 mins walk, shop 5 mins walk. Note: There is a micro pub to the rear of the property. Note: Adults & babes in arms only. Region: Kent is affectionately known as the Garden of England. Its history and heritage provide the region with a rich array of sightseeing possibilities, while the stunning choice of Blue Flag beaches offer the chance to enjoy the beautiful coastline. Town: Sometimes referred to as the "Pearl of Kent", the lively town of Whitstable dates back to before the Domesday Book and is home to a local museum and art gallery - hosting around six new exhibitions each year and boasting a coffee shop. Whitstable Castle dates back to the 1790s and hosts numerous events including a big May Day celebration with contributions from local musicians and artists. One double bedroom. Ground floor shower room with shower, basin and WC. Kitchen. Sitting room with dining area with woodburning stove. Electric central heating with woodburning stove. Electric oven and hob, microwave, fridge, washing machine, TV with Freeview, DVD player, WIFI, hair dryer, selection of books and games Fuel, power and starter pack for stove inc. in rent. Bed linen and towels inc. in rent. Free roadside parking around property. Private front garden with patio/gravel/shrubs, furniture and BBQ. Sorry, no pets and no smoking. Pub 2 mins walk, shop 5 mins walk. Note: There is a micro pub to the rear of the property. Note: Adults & babes in arms only. Beautiful cottage. Lovely and cosy on a winter weekend. I would recommend this cottage. Close to town and restaurants.